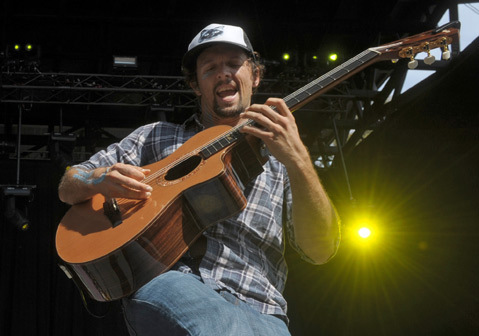 The Santa Barbara Bowl welcomed Jason Mraz on a scorching Labor Day for an early show as part of his Tour Is a Four Letter Word outing. The late afternoon set list paired well with the long weekend, as well as the night’s do-good message. Nonprofit Life Rolls On (LRO) was the beneficiary of Monday’s concert supporting spinal-cord-injury research and quality-of-life support. Founder Jesse Billauer and Mraz worked closely together and put the show on to honor the 17th anniversary of Billauer’s surfing accident, which happened when he was 17 years old. A variety of guests were welcomed up to the mike, too, including drummer Michael “Leroy” Bram, percussionist Toca Rivera, and budding singer Cody Lovaas. Together, the crew sang “Rescue,” which Mraz dedicated to all of the volunteers of LRO.